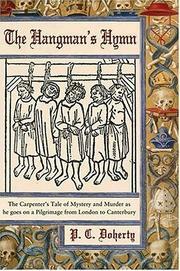 In the latest installment in prolific Doherty’s dark version of the Canterbury tales (Ghostly Murders, 1998), the Carpenter pilgrim tells a bloodcurdling tale of hanged men who refuse to stay dead and buried. Moving to Gloucester in pursuit of Alice Draycott, young carpenter Simon Cotteril finds that the local Guild actively discourages freelance tradesmen—and Alice’s father has no use for penniless ones. Desperate, he accepts Friar Martin’s offer to join the band of hangmen, an exceptionally prosperous bunch including the friar; Merry Face, with an eponymous facial disfigurement; Flyhead, bald with insect-shaped birthmarks on his skull; and their leader Shadbolt, a former mercenary. But Simon’s new trade has an uncanny side effect: He sees men he helped hang walking around town. His fellows, it seems, have a medieval scam going. For a price, they spare certain felons. The game seems literally harmless and certainly profitable until a trio of witches are convicted of a series of horrific killings. The hangmen execute them, but during a harrowing night, the witches escape their gibbets. People involved in their trial and execution are murdered, and Simon must track down the witches and their mysterious leader before he becomes the next victim. Bruised throats, blood, guilt, and satanic rites—but ultimately Simon survives using his wits rather than copious amounts of holy water.